> Meet James, Our Head Beekeeper, Guest Speaker at The London Honey Show, this Sunday! James Hamill who was awarded London Beekeeper of The Year by The London Honey Show, has been asked to be one of their guest speakers at this years show. So don’t miss a change to hear about his beekeeping travels around the world and see some of his international collection of beehives. They will be on display at the show. 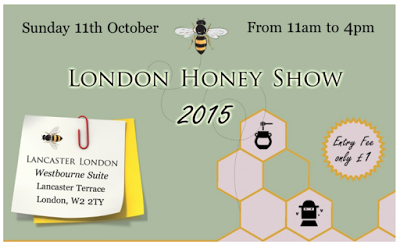 The London Honey Show will be back in town on the 11th October 2015 from 11 am to 4 pm. £1 entry for charity, children free. Address: Lancaster London Westbourne Suite, Lancaster Terrace, London W2 2TY To find out more by visiting their site. James Hamill has been instrumental in tirelessly publicising and encouraging Londoners to keep their own bees for over twenty-five years now. James has been a beekeeper since the age of five, a third generation beekeeper, and this enthusiasm for bees and beekeeping is still infectious. James is the head beekeeper for The Hive Honey Shop in Battersea London, maintaining over 100 beehives in London and the countryside. www.thehivehoneyshop.co.uk. James pioneered the first rooftop and attic beehives in Clapham, installing the largest indoor observation hive with the longest access to the world. He travels around the world working and consulting beekeepers in ways to manage and support their bees in healthy and safe ways. James has been teaching adult beekeeping courses since 1990 and is a past winner of the title ‘London Beekeeper of The Year’. James is a great ambassador for London Honey. He has been interviewed by several trade papers, magazines, TV, and media interviews over the years, always of the opinion that London honey is the one of BEST!